LigerBots Blog - Build Season Has Begun! 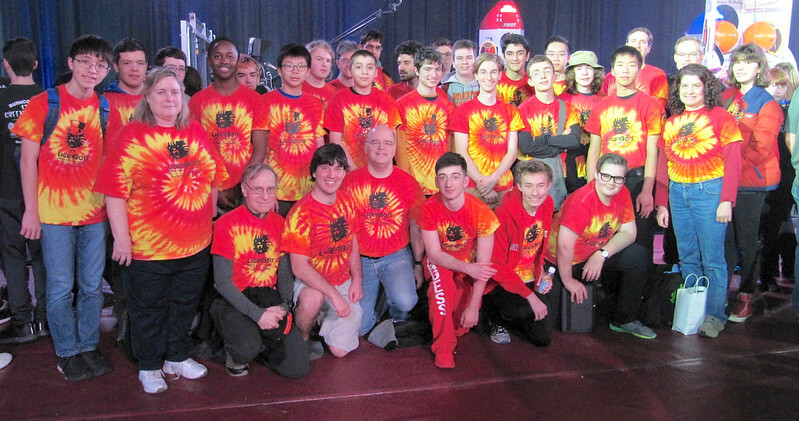 The LigerBots at the FIRST Robotics kickoff in Manchester, NH. Blast off! The robot build season has begun! 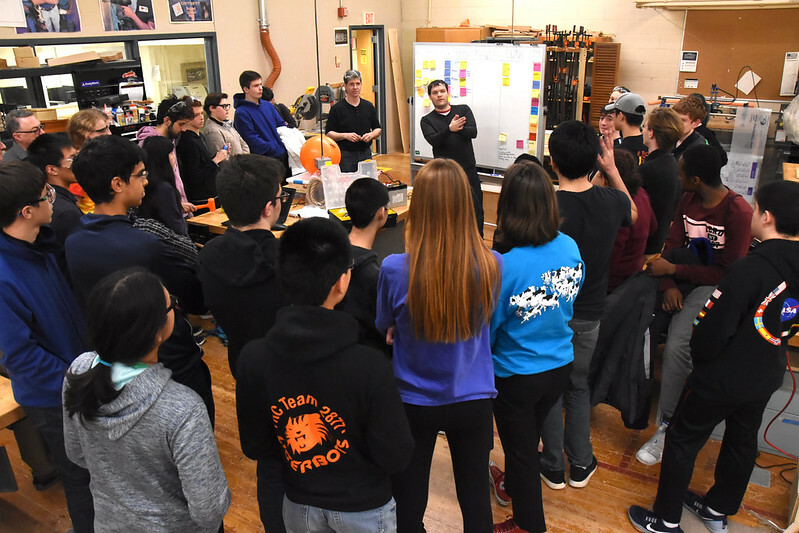 On January fifth, twenty-seven LigerBots students and ten mentors made our annual pilgrimage to Manchester, NH, the home of FIRST founder Dean Kamen, to attend the FIRST Robotics 2019 Destination: Deep Space robot game challenge reveal and kickoff. We had so many LigerBots that we occupied eight cars and nearly a quarter of the bleachers at the Southern New Hampshire University. The view from the bleachers at kickoff. 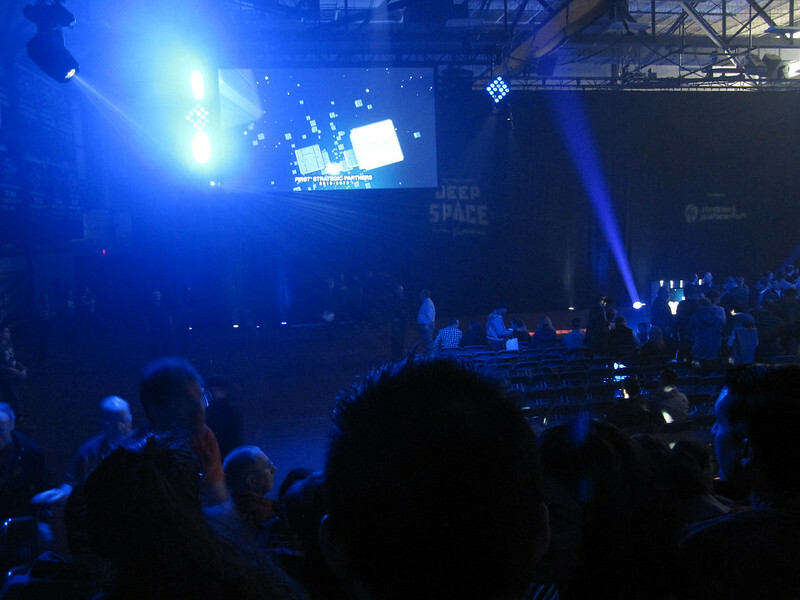 In addition to watching the outer-spaced themed game reveal video, we listened to speeches by Dean Kamen, Woodie Flowers, and New Hampshire governor Chris Sununu, and got access to the encrypted game manual so that we could learn all of the rules. Our students were so eager to know the details that many of them read and discussed the entire, 125-page manual in their carpools on the way back to Newton. Everyone wanted to be ready for intense discussions in their three-day design groups the next day. Our first view of the 2019 playing field, at kickoff. 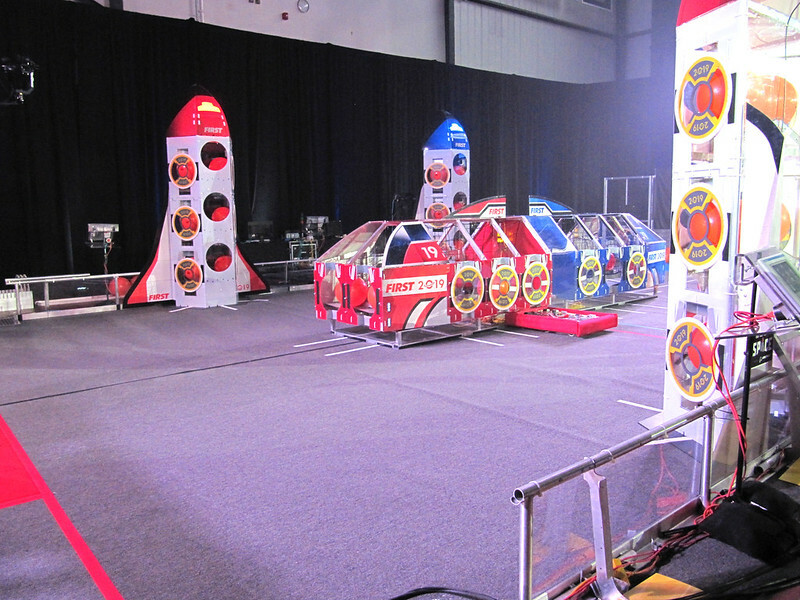 To score points in the 2019 game, hatch panel disks must be loaded onto the front of the holes on the “rocket ship” and “cargo ship” to prevent “cargo” from falling out, and playground ball “cargo” must be loaded into various holes in the ships. The LigerBots three-day design process is our way of including every team member, no matter what their usual area of concentration on the team, in the design of our robot. By spreading our rookies and veterans out among the groups we give our newer and quieter members an opportunity to demonstrate, lead, and speak. 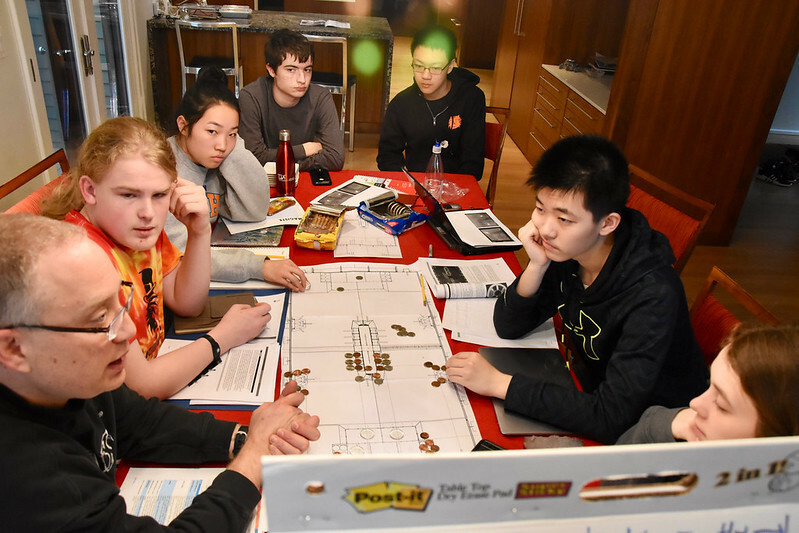 All team members, including those who usually work on non-technical tasks, meet for two days in groups of nine or ten team members and a mentor, to brainstorm game strategy and general mechanical approaches to accomplishing tasks in the robot game. On the third day a panel of representatives from each group presents the groups’ recommendations for game strategy and robot mechanisms. 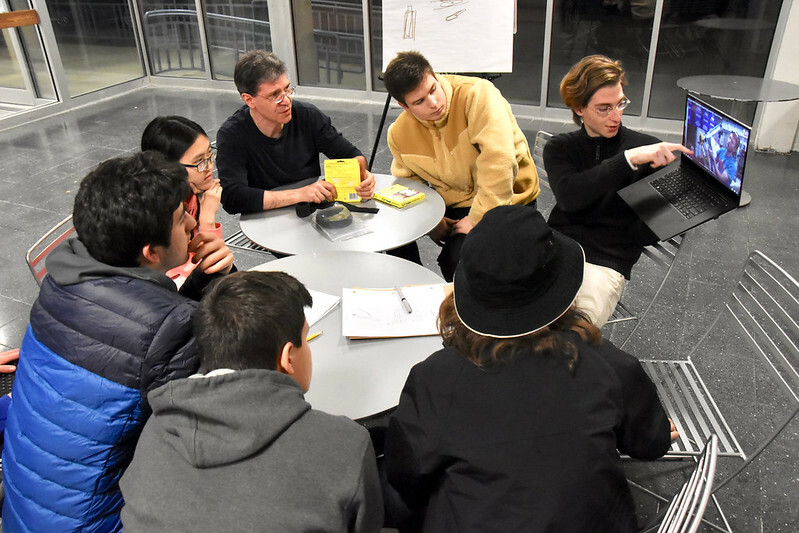 A three-day design group led by field elements mentor Jay Schwartz (at left) works with a mockup playing field to discuss game strategy. Because our team is so big this year we had nine groups, all meeting at different locations during the two days after the game kickoff. Some groups sketched strategy decisions and preliminary designs on a whiteboard, some used a mockup of the playing field to push around game elements. But, every approach led to lively tactical debates about how to score the most points and about the best way to maneuver this year’s game pieces: a playground ball that represents spaceship cargo, and a flat disk that represents a rocket ship hatch panel. A three-day design group led by 2016 CTO Max Tepermeister (at right)watches video of other teams’ solutions to mechanical challenges. 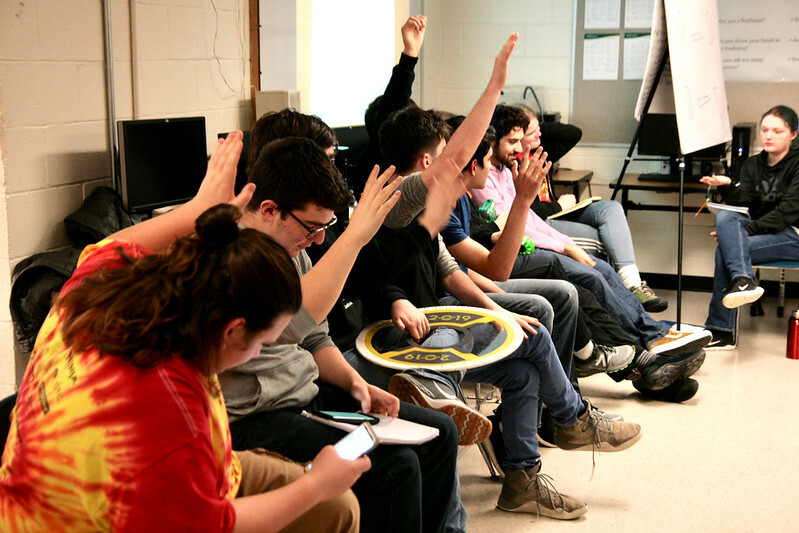 The leaders of our various build groups (who specialize in various mechanical, electrical and programming features of the robot) met on the fourth day to discuss the groups’ proposals and come up with a robot design that would accomplish the consensus game strategy. Our initial ambitions are to place the “cargo” and “hatch panel” into both the low and high goals on the “rocket” field element, and to climb onto the second level of the “habitat” home-base platform. 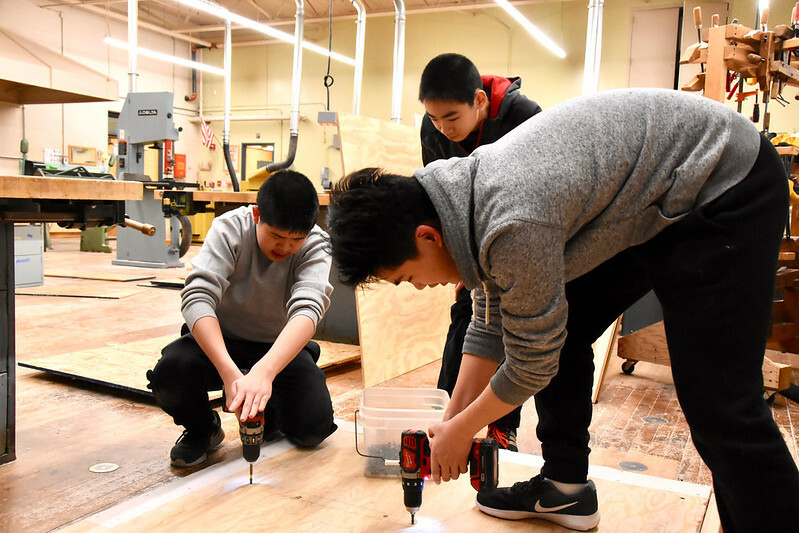 We may add more skills to our robot if we find we have time to do so during our six-week build season. Our panel of three-day design group reps votes on a proposal made by CTO Samy (at right). 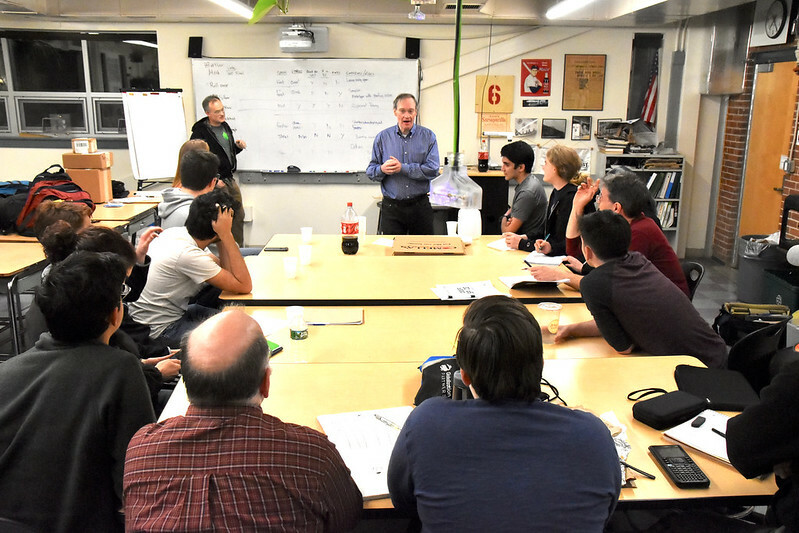 Mentor Bruce McVittie helps build leaders reconcile various proposals for robot mechanisms. Our students are now creating our mechanisms with computer aided design (CAD), building field elements to allow us to test our mechanisms, and are experimenting with the game pieces on various surfaces to see how they can best be manipulated. We have begun tracking our processes using the Trello and flame chart project management tools we introduced last season. Project management mentor Dan Lavoie demonstrates the sticky-note task board to the team. Students start constructing the “rocket” field element. Our weekly team dinners have begun, and we are happy to have those brief moments on Friday to eat, relax, and talk about everything we are accomplishing. 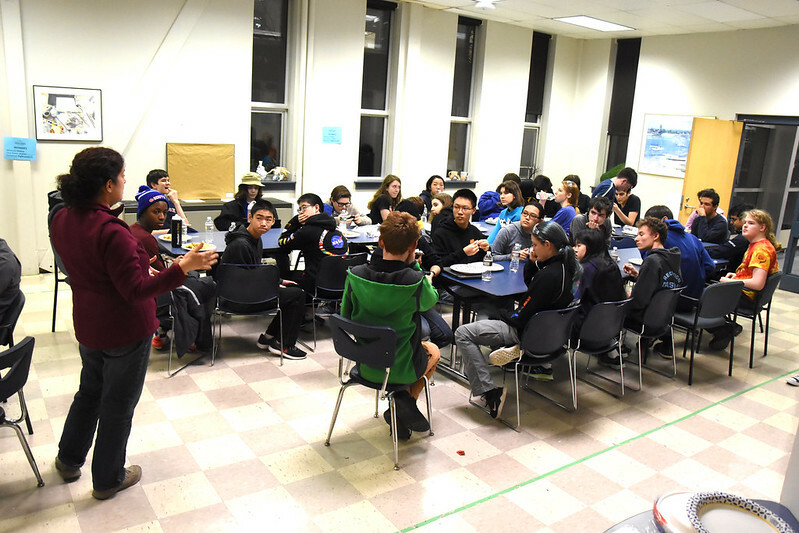 Co-head coach Noa Rensing makes announcements after our weekly team dinner. The marketing side of our team has also gone into high gear now that we know the robot game. The awards submission group has started writing our Chairman’s Award essay and is devising questionnaires about LigerBots activities to send out to our team members. The awards group has to finish their submission in early February, even before our robot is finished. Team members are using the elevator pitch skills they learned earlier this fall to pursue the corporate sponsorships and individual donations that allow the team to fund our robot build and outreach activities. The graphics group has turned from their fall training in designing outreach STEM activity flyers to work on our robot repair-pit banners that show off the game theme and our team sponsors. Work has also begun on the booklet we produce annually that describes and illustrates everything we do at the LigerBots. We are all so glad to have had the fall to learn new skills. All of them are getting put to good use now that we are in the most exciting and demanding part of our year.